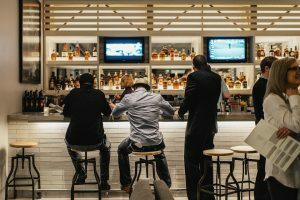 The bar + lounge at The Hive is the perfect place to quench your thirst, entertain important clients or grab a casual bite with friends. Choose from a rotating selection of seasonal cocktails or explore the bottled beer list to discover a new favorite brew, including some local favorites. Ready to shake things up? The bartenders at The Hive bring new life to craft cocktails with farm fresh ingredients and creative interpretations of classic favorites. Or broaden your horizons with a walk through The Hive’s smart wine list. New and old world wines are available by the glass, quartino or bottle, with a special emphasis on biodynamic wines.